As previously reported, the American Humanist Association (AHA) sent a letter on Tuesday to the superintendent of Hall County Schools, the principal of Chestatee High School and the chairman of the Board of Education after it received any complaint from a local resident about practices at the school. The organization threatened a possible lawsuit if the practices are not discontinued, requesting that a response be received in two weeks. District officials state that they are conducting an investigation into the matter. But students at Chestatee High School decided to demonstrate their support for the football team on Wednesday by gathering together to pray on the field. According to reports, an estimated 200 students and their parents huddled on the field in solidarity, and a second gathering, which was said to have been even larger, was held on Thursday at another location on the campus. 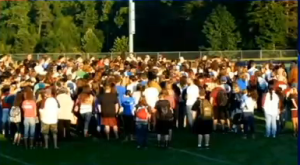 “We choose to pray, they don’t make us pray,” Megan Ellis, a student at Chestatee High School told reporters. “I think it’s sad that you can be in a state prison, and you can have a Bible and read it all day long, and you can have a worship service inside that prison, but you can’t pray on a football field,” said parent Kevin Elrod.